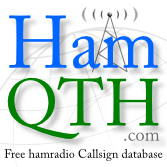 The QRZ.com website contains almost every amateur radio callsign in the world. It is best described as the 'phone book' of amateur radio. Amateurs can create a user account and then create a page with their station details, antennas, photographs and other information. QRZ.com CD is carried on board the International Space Station, and was carried on board the Russian Mir station.